People use apple cider vinegar as a remedy for conditions like diabetes, weight loss, acne and high blood pressure as it has been known to support healthy living for years. Research on the benefits of apple cider vinegar, however, is conflicting and you should always speak to your doctor about how much apple cider vinegar you can have. How Much Apple Cider Vinegar Per Day Should I Consume? You can either take tablets containing dehydrated apple cider vinegar or dilute the liquid in a cup of water. As it is an unproven treatment, there is no official recommendation as to how much you should have, however most people who drink it have approximately 2 tbsp a day. Apple cider vinegar has an acquired taste, so if you are not used to drinking it, then add it into your diet gradually. Apple cider vinegar does help to boost your metabolism and helps you feel full, and this works best if you drink it an hour before each meal or first thing in the morning. How much apple cider vinegar per day for weight loss depends on your personal preference. Begin by adding 1 tbsp to a cup of water and gradually increase the amount until you are drinking 2 tbsp per cup of water. Diluting is important to protect your teeth from being eroded by the acidity. Organic apple cider vinegar contains tons of nutrients and bacteria, which is great for your health. It is unfiltered and unpasteurized, which means that it will have some sediment at the bottom. So shake the bottle before using it. Non-organic versions, however, would be clear in color. 2. Can I Drink It Raw? It is best to mix apple cider vinegar with water to dilute the acidity, and you can add some honey to make it taste a little better. Because of the acidity, it is recommended to drink it through a straw. Another option is to rinse your mouth out with baking soda to neutralize the acidity. However, you shouldn't brush your teeth immediately after drinking apple cider vinegar as the tooth enamel can be very vulnerable at this time. Rinse your mouth thoroughly and wait at least thirty minutes before brushing. 3. Can I Drink It with Tea, Coffee, or Juice? For the best results, you should drink apple cider vinegar with water, however you can drink it with tea, coffee or juice. When thinking about how much apple cider vinegar per day to drink, maintain the same ratio as you would when mixing it with any drink. It is important to note that the caffeine in tea or coffee can interfere with the absorption of the vinegar. Try decaf or herbal tea if possible. 4. Does It Interact with Medicine? 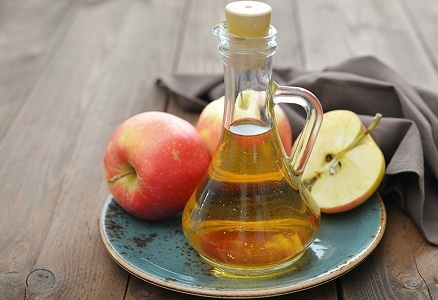 As apple cider vinegar is made from apples, it is fine to drink while on medication, however some research suggests that it can reduce the absorption of some medicines. You may need to talk to your doctor if you are on any medication, are pregnant or breast feeding. Although there isn’t any research to suggest a danger, it is always safer to check. As organic apple cider vinegar is unpasteurized, it is recommended that pregnant women do not drink this since unpasteurized foods can bring bacteria that negatively affect the baby. When thinking about how much apple cider vinegar per day to consume, it is important to remember that it is very acidic. Therefore drinking large doses could erode your teeth and burn your mouth. Anyone with osteoporosis or diabetes should take precautions when drinking apple cider vinegar, as it can affect bone density and insulin levels if taken in large amounts. People taking diuretics, laxatives or medicine for heart disease should always consult their doctors before drinking apple cider vinegar. How Much Fiber Should I Eat a Day? Does Sparkling Water Make You Fat?